Last year going into their season opening tournament in Lamar, Colorado, the Seward County Lady Saints didn’t quite know what to expect because of their inexperience in the lineup. When they open the 2014 season on Friday in Lamar, they won’t know quite what to expect for a completely different reason, and a good one, their early season depth has been so strong that their lineup has yet to be set for the weekend. The Lady Saints return nine players from last year’s 22 win team including five starters from that squad that finished with 10 wins, good for 3rd place in the Jayhawk West standings. Leading the charge for Seward is the reigning Jayhawk West Freshman of the Year Carolina Gasparini who had a huge rookie campaign for the gals in green a year ago. Also returning to the mix is 2012 All-Conference selection Thayna Silva who comes back into the fold after a year rehabbing from a knee injury. The Lady Saints backline remains fully intact from last season as Kari Anderson and Kelci Bedingfield return after combining for nearly 1,000 digs as freshman in 2013. 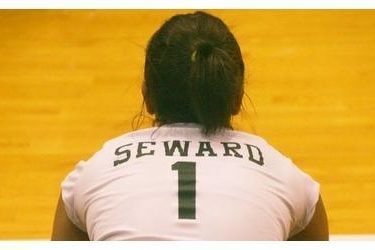 Kristen Anderson started all 39 games for Seward a year ago on the right side and as an emergency setter and will look to improve upon a solid freshman campaign this year. Carolina Freitas, Erika Gilbert, and Sheree Ryan round out Seward’s sophomore group and the experience continues with them as each saw action in 25 or more matches as freshman last season. The Seward freshmen seeing their first live action this weekend bring their own sets of ability into the mix for the Lady Saints. The five Lady Saint rookies are a good sized group with 6’3 and 6’1 middles Megan Sharratt and Lindsey Schwab as well as 5’10 outside hitters Alex Wood and Angelina Minor and 5’11 setter Taryn Bedore. Success in the Jayhawk West and the NJCAA in general usually hinges upon teams strengths on the outside, and that is one position where Seward is certainly more than comfortable with going into the year. Gasparini returns after leading the Lady Saints in kills with 430 a season ago and the Brazilian hitter was one of just two players in the conference to rank in the top 10 in the Jayhawk West in both kills and digs in 2013. Silva looks to return to her 2012 form after garnering 1st Team All-Jayhawk West accolades during her freshman season when she ranked in the top 5 in the league in both kills with 329 and digs with 434. Challenging the pair for playing time on the outside will be a pair of newcomers in Minor and Wood. A highly recruited prep out of Portland, Oregon, Minor will look to make an immediate impact in the Seward rotation with arguably the heaviest swing on the Lady Saints roster as well as her size and athleticism at the net on the defensive end. Wood has been a pleasant surprise for the Lady Saints during the preseason, finishing the exhibition portion of the schedule with 11 kills and just 1 error in a pair of wins on Wednesday. In the middle the Lady Saints will have four very different options to choose from when the lineup is drawn up. Freitas is certainly the most improved returner for the Lady Saints thus far and will almost certainly improve upon a freshman season that saw her average over a half a block per set on the year. Sharratt, a freshman from Albuquerque, New Mexico, is the tallest Seward player on their roster and provides Head Coach Bert Luallen with an imposing figure both offensively and defensively at the net for the Lady Saints. Schwab comes in from Canon City, Colorado and after being a two sport star as a prep, will concentrate soely on volleyball this season. At 6’1, she is a hindrance for opposing hitters and will also give the Lady Saints some firepower on the offensive end. Gilbert played in 37 matches a year ago as a freshman and ended the year with 72 kills and 56 blocks for the Lady Saints. The quickest of Seward’s middles, she will provide Seward another different look at the position. On the right side the Lady Saints have a number of different players that they are looking to plug in. Kristen Anderson is the natural choice after starting all 39 matches for Seward a season ago at the position but with the depth at both the outside and middle positions, she will be pushed by Minor, Gasparini, Silva, and Schwab for possible playing time. After going a year with just one setter in 2013, the Lady Saints are certainly thankful to have reinforcements on the roster in 2014. Miller had over 1,000 assists a year ago in Seward’s 5-1 system but Luallen will have options this season as Bedore comes into the mix. Bedore brings a taller frame at 5’11 and has the ability to play multiple positions in addition to her setting duties. Freak injuries to both players kept them out at times during the preseason, but both are expected to be at full strength as this weekend rolls around. The one spot where there isn’t a whole lot of question marks going into the year is at the defensive specialist position. Kari Anderson and Bedingfield have those spots locked down after each put up solid numbers a year ago as rookies. Anderson will likely be Seward’s libero to open things up on Friday after ranking 6th in the Jayhawk West in digs with 519 last season. Bedingfield missed most of the preseason with an injury, but will be close to, or ready to return this weekend after she contributed 476 digs in 2013 as a freshman. The Lady Saints get things going at 1:00 on Friday when they take on an Otero team that picked them off three times a year ago. This year’s Rattlers will look a little different than their 2013 squad, with a number of new faces on the roster, but seventh year Head Coach Melissa Anderson has made Otero a force to be reckon with in Region IX in the past few seasons. Seward’s second match on Friday will be against Clarendon at 6:00 in the two teams second meeting in six days. In a preseason scrimmage last Saturday the Lady Saints easily dispatched of the Bulldogs in a three set win. On day two of the tournament the Lady Saints will get the host squad, Lamar, in another rematch of last weekend’s scrimmages. In that one it was Seward winning all four sets played between the two including 25-8 and 25-5 wins in the process. They close the weekend with a test against Bethany’s JV squad, a team that will likely be made up of freshmen and sophomores from the NAIA school. For updates throughout the weekend, make sure to stay tuned to the Lady Saints Twitter feed at @SaintsSports as well as to their athletic website at www.SewardSaints.com<http://www.SewardSaints.com>.